"Eric and Aileene Markham's Caravan"
"Eric and Aileene Markham's Caravan" is owned by Eric and Aileene Markham from Gold Coast Qld. 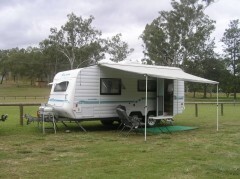 Our home for the next year or three is our 1999 Boroma Brezza. A 19foot oldie but a beautifully built caravan. It sits on Alko independent suspension with 16inch wheels. We have a Aussie Traveller awning with full annex and hydraulic legs support us when camped. The tow vehicle is a 2000 Landcruiser GXL 105R , it has a Safari Turbo, snorkel, Beaudesert 3'' exhaust system and is fitted with Clearview mirrors. The back section of the cruiser has been partitioned to accomodate the fridge slide , tools and the Honda 2kva gen set. 365 watts of solar power and 3 x 120AH gel batteries provide powerthrough a Prostar 30 amp controller. Refrigeration is a 120ltr Vitrifrigo two door with a 60ltr Bushman in the cruiser. 240 volt charging is done through a TRACE 1500w inverter charger , with a smaller inverter for small appliances.